What Are the Benefits of Kelp Powder? Michelle Wright has written articles, press releases and newsletters throughout her writing career, which began in 1982 at John W. North High School in a yearbook class. Wright studied Childhood Development, Communications and Care for the Elderly at Riverside Community College, Mt. San Jacinto and Chaffee Colleges in Southern California. 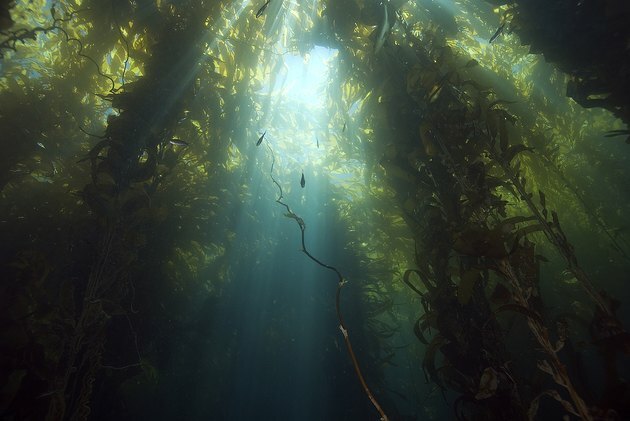 Kelp, a type of seaweed that grows in colder ocean regions, relies on the sun for development. Shallow, coastal waters in the Atlantic and Pacific oceans are primary sources of this nutrient-rich plant. Powdered kelp is often found encapsulated for easy ingestion. In their article, "Guide to Super Foods," Sally Fallen and Mary G. Enig, Ph.D., explain that kelp provides minerals found in sea water, such as iodine and other trace minerals that may be lacking in the soil. Adding kelp powder to your diet may provide health benefits, but consultation with your health provider is recommended before taking dietary supplements. A study published in an 2010 issue of the "Pharmaceutical Biology" shows that kelp, also known as Laminaria japonica, has the ability to lower cholesterol levels. Not only were LDL or bad cholesterol levels reduced, but kelp also lowered triglycerides and raised HDL or good cholesterol levels. Adding kelp powder to assist with lowering cholesterol should first be discussed with your doctor. Comparing the diet of Japanese women to that of American women, one factor that stands out is the regular consumption of sea vegetables, including kelp, in the Japanese diet. This may be a factor in the lower incidence of breast cancer among Japanese women, according to the American Cancer Society. Laboratory studies have shown that substances found in several varieties of algae, kelp being one of them, both inhibited the growth of cancer cells and initiated the death of cancer cells in rats. Studies using kelp supplements with human subjects are still needed for conclusive evidence. Promising research in Korea involving patients diagnosed with Type 2 diabetes, indicates that ingestion of bladder wrack kelp lowers blood sugar levels. Published in 2008 in "Nutrition Research and Practice," this study concluded that eating seaweed influences glycemic control. Kelp powder is not meant to replace conventional medicine, but instead to offer a nutritious food option. Kelp powder offers a convenient way to ensure a regular source of iodine, the trace element needed for healthy thyroid function. Americans living far from the ocean find it difficult to adapt to the taste of seaweed. For those individuals wishing to avoid the salty, mouth-puckering taste of kelp, ingesting the encapsulated powder will prevent a taste bud rebellion. "Guide to Superfoods” by Sally Fallen and Mary G. Enig, Ph.D.